The Trump presidential election win has pushed capital into a major risk on rally, benefiting stocks, energy and the US Dollar. Interest rates are soaring in line with the Dow Index breaking 20k indicating major inflationary pressures. Commodities such as industrial metals, copper and oil are also rallying. The junior gold miners could be on the verge of breaking a six-month downtrend. A few weeks ago in an article titled, Seasonality Favors Precious Metals And Junior Miners Going Into Year End , I attached the following chart. 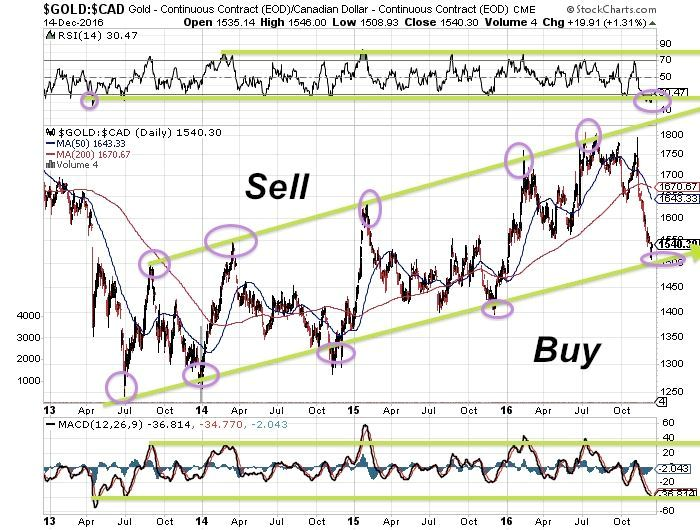 In the article, I wrote "The precious metals are very oversold and ripe for a reversal as they usually bottom at year-end then have massive rallies in the new year. This seasonal pattern has been strong even during this bear market." Now two weeks later, it appears gold may have bounced off its support and is making some bullish reversals as shown on the charts. I am closely following to see if the junior miners can break the recent downtrend and regain the 200-day moving average in the New Year confirming a new bull market rally. This could set up for its next bull rally like it did in 2016. Despite this downward correction, the junior gold miners are outperforming stocks (NYSEARCA:SPY) and bonds (NYSEARCA:TLT) on the year. The markets are pricing in inflation following the Trump presidential election win and that should benefit metals. U.S. stocks are soaring to record highs and the Dow is on the verge of breaking 20k, a major psychological level. Investors should be prepared for volatility as President Trump will counteract a lot of Obama's moves over the past eight years, which could accelerate moves in many markets. Notice already that U.S. bonds are breaking down, as capital is flowing to riskier assets, most notably stocks, copper (NYSEARCA:JJC) and energy (NYSEARCA:XLE). To me, this signals inflation, rising interest rates, and major policy changes, which is already having dramatic effects on portfolios. I am amazed that the US dollar (NYSEARCA:UUP) is still rising despite many bonds crashing. All fiat currencies except the US dollar are crashing. There are even some places around the globe experiencing hyperinflation, most notably Venezuela and India. Investors are dumping their foreign stocks and paper in favor of U.S. Stocks and US dollars. An artificially high US dollar could stress borrowers who have to pay back loans. Most notably affected could be the US Federal Government, who is already in record debt. That is why we still love junior gold miners (NYSEARCA:GDXJ) and, even more so, silver miners (NYSEARCA:SIL). Trump will not let foreign nations continue devaluing their currency to gain an advantage on the US. I expect Trump will do whatever he can to stimulate spending and growth to make America great again, maybe by putting capital into infrastructure. This should benefit the domestic steel (NYSEARCA:SLX), copper (NYSEARCA:COPX) and energy sector. Attention should be paid to the lithium sector (NYSEARCA:LIT), as well, since Tesla (NASDAQ:TSLA), that recently announced a deal with Panasonic (OTCPK:PCRFY) to manufacture solar cells to be used with the Lithium Ion PowerWalls. This could be the sector which "trumps" the rest over the next decade, bringing thousands of jobs back to the US. In addition, Trump loves nuclear, and I expect major investments will be made to update and expand our nuclear fleet of reactors. He has already caused a major bounce in the sector after a couple of tweets promoting nuclear energy. Investors should look to gain exposure to the Uranium Mining ETF (NYSEARCA:URA) as Trump may look to build our domestic nuclear sector since we can no longer rely on imports (especially when we have millions of pounds of uranium in the Southwest). There have been many small uranium miners raising money after the Trump win, which may auger a bottom. I suggest to continue to follow the tensions in the South China Seas, with the potential theft of a U.S. military drone. Could China have taken that drone to see what rare earths the U.S. was using to power and guide the advanced drones? All the metals which China has control of should be watched closely. Focus on rare earths (NYSEARCA:REMX), graphite, and other strategic battery technology metals such as scandium and cobalt. Trump has hired Peter Navarro as China trade advisor, and the Chinese are already threatening a trade showdown. Hopefully, Trump will move fast to help secure our own supply chain of critical metals, as that is how the Chinese can squeeze the West. Take a look at some recent developments in this sector, some of which should be looked at for 2017. Remember that there is no current U.S. production of flake graphite used in high tech batteries. Smart money wants some exposure to fertilizer stocks as inflation increases. Keep a close eye on silver miners especially deposits with high grade in safer jurisdictions like Canada. Also, British Columbia and the Yukon have some of the highest grade silver in the world. Recently, a junior near-term Yukon gold developer was acquired by Goldcorp (NYSE:GG). Could some of the other big silver producers look to come into Yukon's Keno Hill or British Columbia's Golden Triangle where some of the highest grade silver is found? Jeb studied engineering and mathematics and received his undergraduate degree from University of Buffalo and a Masters Degree at Nova Southeastern University. Teaching technical analysis to professionals in South Florida for over 7 years, Jeb began a daily newsletter which grew to include thousands of readers from over 40 nations such as China, India, Singapore, Malaysia, Thailand amongst many others who are interested in the North American Resource Market. His website at http://goldstocktrades.com. You can reach Jeb at: info@goldstocktrades.com.